Many experienced handlers asked to take the dogs but were initially refused. After several members of the military took up their cause, the dogs were spared. They left no soldiers behind and now the soldiers with whom they served have returned the favor. 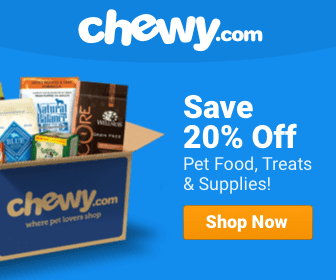 Two U.K. military service dogs, considered heroes by all who know them, have been saved from euthanization after a public outcry from the men and women with whom the dogs served inspired a nationwide effort to instead re-home them. The dogs are based at the Defence Animal Centre in Melton Mowbray, Leicestershire. 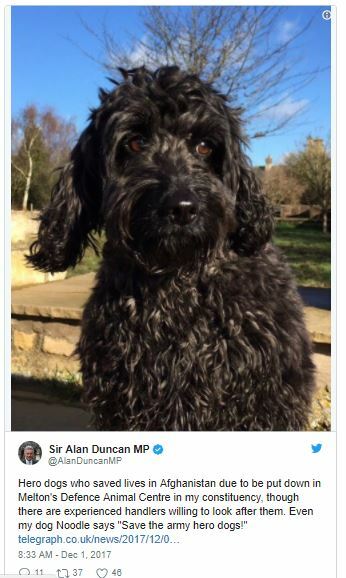 Foreign Office minister Sir Alan Duncan, a dog lover, was outraged by the fact that three dogs, who saved thousands of lives while serving with the army, were due to be put down, the Telegraph reported. Chiefs had ruled that they could not be re-homed safely, to which experienced handlers loudly balked. Many offers to take the dogs were reportedly refused. “People who worked closely with these dogs are devastated at the plans — they’ve begged to save them all,” one handler told the Sun. 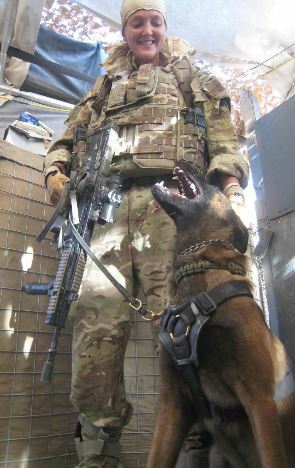 The two Belgian shepherds, Kevin and Dazz, detected IEDs in Afghanistan, will be permitted to live out their lives in happy retirement. 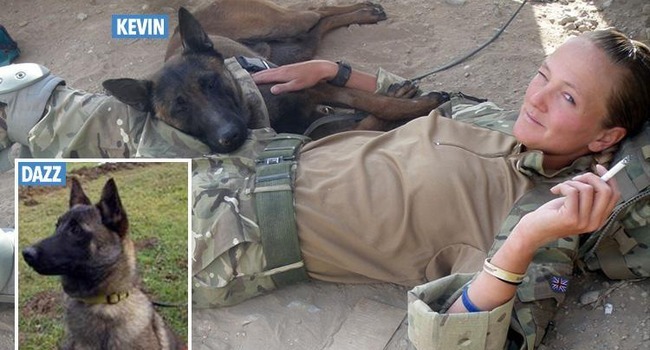 Said Duncan on Monday night: “I’m absolutely thrilled that army hero dogs Kevin and Dazz have been saved. They can now enjoy a very happy and well deserved retirement…..” noting that the dogs had “fought fearlessly alongside our soldiers. “Let us now be the ones to fight for them and give them a chance to live happy lives where they can thrive. It is the least they deserve. A third dog, a former police dog named Driver, was also saved after former soldier Andy McNab started a petition to prevent him from being put down. The petition – which gathered more than 370,000 signatures – praised service dogs for, McNab wrote, saving “countless lives when I was in the Special Air Service sniffing out explosives…. In Afghanistan when I was on a patrol the dogs found an IED in front of us, I was number three in line, I was very, very lucky to survive,” he wrote. The Sun reported that Kevin and Dazz, both 9, retired about four years ago and will be adopted, as will Driver.